The picture below related to the words Doctors, Physical Therapy, Auto Insurance Adjusters, Car Accident Attorneys​ is offered under a Creative Commons Attribution-ShareAlike license which permits the free use of the image by anyone as long as the user follows the terms of the license. See license details below. 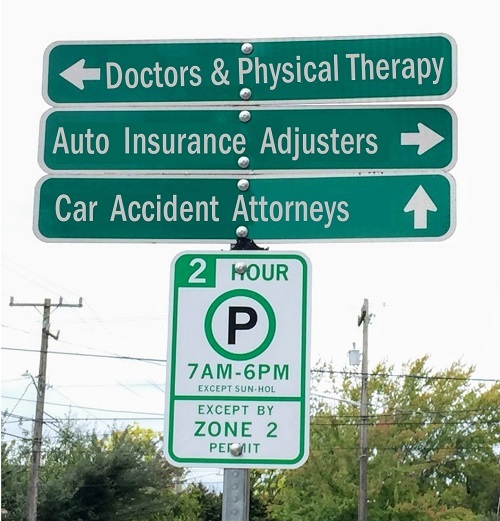 Directional Sign: Doctors, Physical Therapy, Auto Insurance Adjusters, Car Accident Attorneys by Mischelle Davis / Davis Law Group is licensed under a Creative Commons Attribution-ShareAlike 4.0 International License.